I’m now into my second summer of having a Landroid WR110MI S700 and I have to say it has been brilliant. I replaced my Bosch Indego with this model, it has been very reliable and so easy to use. My garden is roughly 600 metres square with a few trees and a kids play area to go around. The WR110MI deals with this really well going out every day and keeping the lawn looking perfect. The set up was really easy, it took around 3 hours to get the whole garden mapped out with the perimeter wire. Going around the obstacles was easy as the pegs provided hold the wire going both ways. On the box there is a measuring guide to tear off. This is super easy to hold against the edge of the lawn to get the wire in the correct position. Once the perimeter wire was in place it was time for the maiden voyage. The first run went really smoothly, first of all it went write around the perimeter then started cutting straight away. The only issue I had with set up was the charging base needs a super flat and solid base as it is slightly flexible. The side charger didn’t align properly on my first charge. It was easily fixed with a patio slab. I sunk this under the charge station and it has worked perfectly ever since. The cut is really good, I always start the year in 60mm gradually lowering the cutting height to 30mm over a few weeks. It was easy to do with a slight turn of the height adjuster on the top of the Landroid WR110MI S700. The cut is random which is slightly different to the Bosch Indego which cuts in stripes but it still looks really good and well kept. I don’t have any long patches in the lawn at all even around some of the more awkward areas. I put the mower and charge station away in November 2017 and got it back out in March 2018. We had a really wet spring this year but this didn’t stop the Landroid being super effective. The rain sensor dealt with these times well only cutting when it was dry. The first thing I did after the winter was put the Worx Landroid on a full charge. After this it went off on the first cut with no issues. I haven’t had to touch it since! This month I changed the blades for the first time. As always I was a bit apprehensive doing the job for the first time but it couldn’t have been simpler. I bought four sets off ebay for £20, gave the mower a clean which took ten minutes and put the new blades on in five minutes. I have to say that is the quickest and cheapest service I have ever seen on a mower of any type! The Landroid can be controlled by Wi Fi using the smart phone app. You can set the mowers schedules and get it to do random cuts where ever you are. It’s a great feature, one that I didn’t have on my old robot mower but I have to say I don’t use it a great deal. The built in schedule sends the mower overnight which suits us fine. I haven’t altered this at all. One noticeable feature of the the WR110MI S700 is that it is quieter than my old Bosch Indego. The Indego used to go at 6.30am every day and you could hear the high pitch wine if you listened carefully. The Landroid is a lot quieter, we really can’t hear it at any point of the night and day unless we are stood very close to it. This model will cut up to 700 square meters which is quite a big garden. Our 600 square metre lawn gets cut in 3 hours which includes a charge break after an hour. Over 700 square metres and I think you would need to go up to the next level as it would take too long to do a full cut. The Landroid WR110MI S700 price is fantastic. Coming in at under £600 it really is a bargain. It saves tons of time which for me adds a lot of value. A petrol mower that is large enough to cut a big lawn is also pretty expensive and you need to add the petrol and servicing on top. This is definitely great value for money. Well I am a massive fan of robot mowers anyway, but this is a great example. 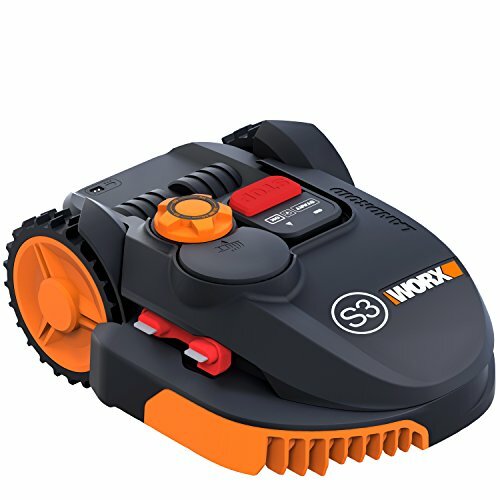 The price point makes it accessible to a lot of people that are scared off by some of the high priced models from the likes of Robomow. It is so easy to install and use, it really can be used out of the box. For the money I can’t really see a down side. Cutting in stripes and a floating deck would be nice but most models capable of this are double the price. My requirements are to have a tidy well kept lawn for the kids to play on whenever they want to go out. The Landroid WR110MI S700 delivers on this and more. I can’t recommend it enough!